More is created on the wedding day than bouquets and confections, favors and libations. It's when new life is created in the form of a family. It may be small at first – or contain three, four, or more – but when those vows are exchanged, it starts a new family off on an incredible journey, one that no other person can know or understand as deeply or as richly as the people within it. Your wedding is about celebrating who you are, where you came from, what you like. It should be personal to you as a couple, as it serves as the medium with which to share the beginnings of your family's story. The day after the wedding is when you start to fill in those chapters - maybe you will travel the world or care for your parents as they age. Maybe you'll raise children with the same passion for the Ravens or maybe they'll miraculously end up with the artistic talent that eluded you. Maybe you'll live on a houseboat or open a business together. Maybe you'll see all of your plans to fruition, and maybe none at all. Now's the time for your real creativity to kick in. In this "Something Old and Something New" series, I will catch up with couples who have already written a few chapters of their family's story. They've been married, 10, 20, 30 or more years. They've seen a few things, experienced a few things, learned a few things (or not...). They are from Tidewater and of Tidewater, even if their personal journeys have flung them far and wide. Get ready y'all... the best is yet to come. 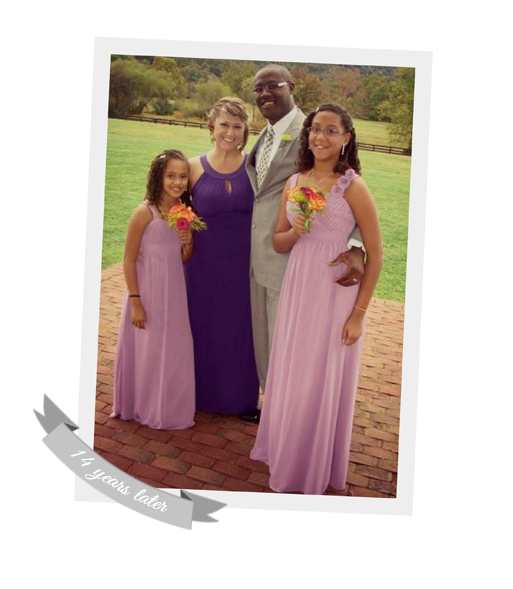 They are a close-knit family of four - mom and dad, Alfonso and Michelle, and daughters Talia and Emelia. An athletic and well-traveled bunch, they are a military family currently stationed in Grand Forks, North Dakota. Alfonso and Michelle met back in 1994 but the Hampton Roads Bridge-Tunnel proved to be a barrier to immediate romance, as they lived at opposite ends of the Tidewater area. Michelle went to Liberty University in 1996 and became friends with Alfredo (Alfonso's older brother). Whenever she would travel back to Virginia Beach to see her family, she'd drop him off in Newport News. Eventually, Michelle became a fixture over at the Hay household, and Alfonso and Michelle started dating in the summer of 1998. Alfonso and Michelle were married on October 9, 1999, at the chapel on Langley Air Force Base in Hampton with the reception in the ballroom of the Enlisted Club, right on the water. Michelle's favorite part of the wedding was when they were announced into the reception as Mr. and Mrs. Alfonso Hay, though her dress, imported from Spain, was a close second (isn't it gorgeous – so classic and graceful). The couple just celebrated their 14th wedding anniversary, but time hasn't jaded them or made them take each other for granted. Marriage is hard work, and they're still learning to get used to each other's idiosyncrasies. They take special joy in the life the Air Force has given them, allowing them to live all over the United States and Germany. The biggest joy of all has been their two daughters, who keep teaching them new things about themselves. Michelle has a final piece of advice to offer newlyweds just starting out – your belief and value system plays a large role in your marriage. You need to be on the same page as each other when it comes to big decisions like raising kids. And from my own personal observation, make sure there's a lot of laughter in your home. The Hays are crazy-close and their energy is infectious to everyone around them. It's obvious when a family has a lot of love to go around – it can't help but be reflected on to the people who have joined them on the journey. Heather Wilson-Atherton is a Florida native who relocated to Hampton Roads about four and a half years ago with a journalism degree in hand. An avid history buff and rescuer of dogs, she just got married in Virginia Beach to another Florida native who politely puts up with her slightly “off” sense of humor and penchant for junkin’ and reality TV. (Well, sometimes. Depends on the day...) When the Gators aren’t consistently breaking her heart, Heather can be found reading, kayaking Rudee’s Inlet, touring the various wineries and breweries in the region, and dreaming of the day when Tina Fey and Amy Poehler jump her into their gang. Photos are from family and personal archive.